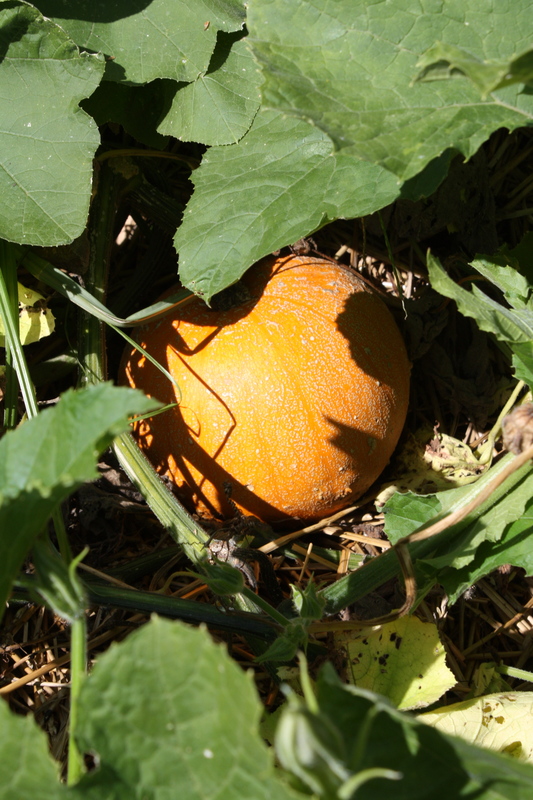 We can feel the season shifting in the garden….cooler nights, heavy dew in the mornings and the days growing shorter. 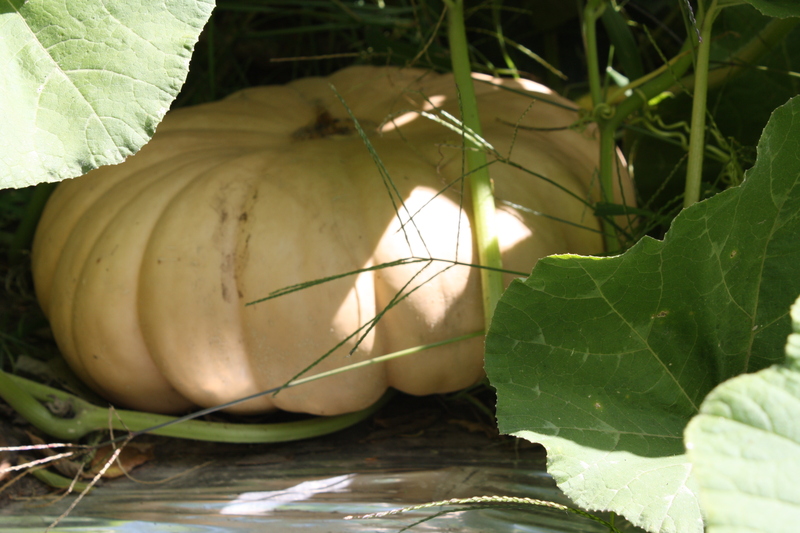 It is fun to go and peek at the winter squash and pumpkins and wonder about the sweet potato harvest that we will be digging soon. We planted the spinach, several varieties of radishes, 2 types of turnips and baby pac choi last week. All crops that like cooler temperatures and have a shorter growing time. We started a variety of leeks in the greenhouse a few weeks back that are suppose to winter over well and we are going to give this a shot this year. We will transplant these baby starts out into the garden this week and hope for jumbo beauties in the Spring. 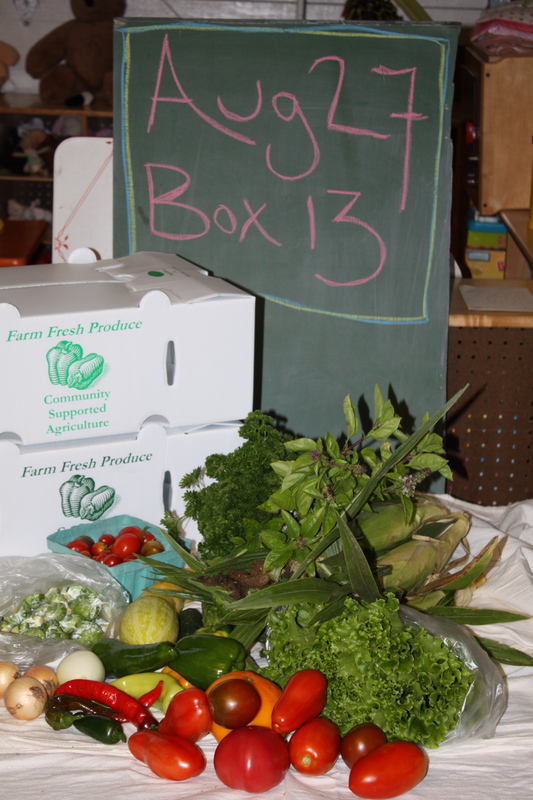 We have not included any eggplant in the boxes this week….even though the plants are still producing like crazy. We took the bounty to the farmers’ market to give everyone a break. It is the year of the eggplant for sure. There are a few in the extra box just in case a few of you want some. A pretty box this week…..enjoy. Corn-Another delivery from Scott’s relative this morning. Lettuce-A head lettuce called Tropicana. This will be the last harvest of this heat loving variety. We have planted cooler lettuces in the garden for the remainder of the season. I am excited for the Romaine to return and it looks like it may be ready next week. Brussels Sprouts-These are the early little gems. We have 3 varieties planted out in the garden. Delicious roasted or sliced and sautéed. Curly Parsley-Nice big bunch. Try making a parsley pesto. Pepper Medley-A wonderful assortment of sweet or mildly hot peppers. Beautiful colors. It is an amazing pepper year for us. The plants are still loaded with fruit. Jalapeño Peppers-A few called El Jefe to flavor your salsa. Onions-All the onions have been dug and our drying on racks in the shed. These are short season onions. Zucchini-The new patch is really starting to produce and the other oddball thing is in 1 evening tons of little slender guys just grew huge! It was pretty amazing. The rain and temperature must have been just perfect. Cucumbers-I think this really is the end…..a few for everyone. Cherry Tomatoes-A quart sized box for everyone. Try oven roasting this week. They are wonderful and sweet. Tomatoes-A great harvest of paste and slice to choose from. Cinnamon Basil-2 varieties to try out. Really tasty with fruits or pasta dishes. 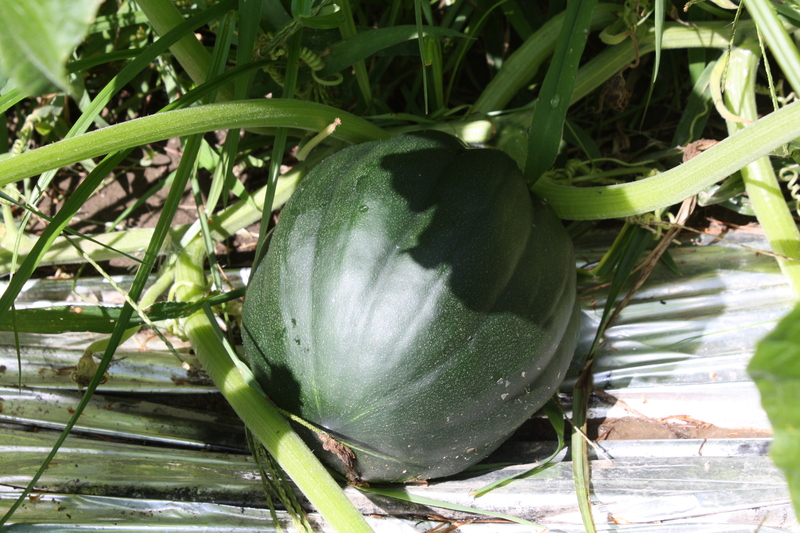 We have another smaller harvest of watermelon this week and they are in the extra box if anyone would like one….also, a few shiitake mushrooms have started to appear and we put them in the extra box as well. A few photos of the autumn crops in the garden. acorn squash resting on the reflective plastic mulch.